Keswick’s Main House summer season opener is the Goodale brothers’ adaptation of PG Wodehouse’s The Code of the Woosters, first seen in the West End in 2013. In many ways it’s the ideal summer show, family-friendly, light, pacy, and funny. The central conceit is that Bertie Wooster has hired the theatre to stage a recent weekend’s scrapes and misdemeanours, but is unable to go more than a line or two before Jeeves’s assistance is required. 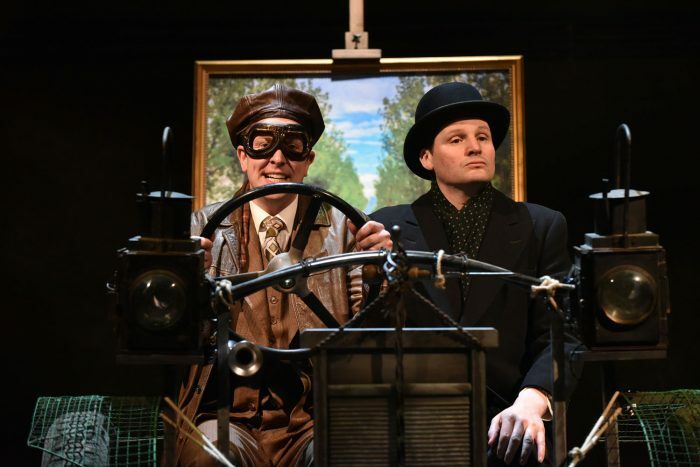 So the play sidesteps the tricky task of bringing the famous Wodehouse prose to life on stage by making a show about Jeeves literally keeping the show on the road, aided by another butler, Seppings. To that end, Colin Falconer’s design is mostly concerned with providing the kind of ingenious, and occasionally hilarious, scenery solutions Jeeves would concoct. Director Philip Wilson keeps the action rattling along and tightly focused. Thomas Richardson’s Bertie Wooster has a nice line in silly grins, becoming more endearing as the show progresses. James Duke, as Sepping, enjoys himself a range of supporting parts, including a wonderfully jut-jawed Aunt Dahlia and a tightlipped take on Wodehouse’s Oswald Mosley sideswipe, Roderick Spode. Theo Fraser Steele captures Jeeves’ lugubrious poise perfectly, and handles his own range of characters with Jeevesian aplomb. While the challenges of keeping a play rolling are not inherently amusing, and the production does make too much of characters’ reactions when faced with some staging challenge or other, the bonhomie builds to a rousingly enjoyable final curtain call routine.